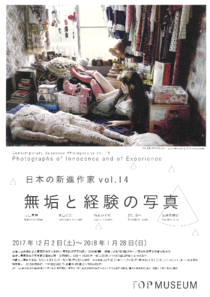 The 'Contemporary Japanese Photography' exhibition has been held since 2002 to provide a venue for new, creative endeavors and offer support to people with creative spirits who strive to expand the possibilities of photography/imagery, in an effort to discover promising new artists. This year's event marks the 14th in the series; entitled ‘photographs of innocence and of experience’, it will introduce past and present works by five photographers who use diverse approaches to create photographic expressions that weave together the pure and individual experiences they have encountered in the course of their daily lives. Born in Saitama Prefecture in 1987, she was brought up in Gunma Prefecture. She enjoyed sewing from an early age. Suffering from congenital tibial hemimelia, she made the decision to have both her legs amputated at the age of 9. After graduating from the Department of Aesthetics and Art History, Faculty of Literature of Gunma Prefectural Women's University, she entered the Tokyo University of the Arts’ Graduate School of Fine Arts where she completed a course in Inter-media Art. She produces -portraits portraits of herself together with her hand-sewn works or her decorated prosthetic legs. She participated in the Aichi Triennale (2013), the ‘Roppongi Crossing’ (Mori Art Museum, 2016), etc. From 2011 she began her ‘High Heel Project’ in which she wore custom-made high-heel shoes to perform on stage as a singer or model. In addition she gives lectures, writes and carries out a wide range of other activities. In this exhibition she will present new works that she created after giving birth for the first time in July of this year. Born in Tokyo in 1971 he moved to the U.S.A. in 1993. After studying at the City College of New York and the School of Visual Arts, he began to work as a freelance photographer while studying Photojournalism/Documentary at the International Center of Photography. 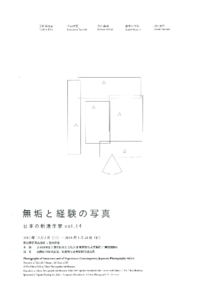 He attracted attention with his work in the ‘Making a Home: Japanese Contemporary Artists in NY’ exhibition (Japan Society, NY, 2007-08), etc., and in 2017 he was awarded the Sagamihara Newcomer Encouragement Prize for his While Leaves Are Falling... photo-book (Akaaka Art Publishing Inc., 2006) and exhibition (Shinjuku Nikon Salon). When he was 20 years old, his mother developed schizophrenia, becoming a completely different person, and this series is a record of her, in hospital, and his two aunts (her sisters). Whenever the artist returns to Japan from New York, the four of them take trips around the country and this series remains a work in progress. Born in Saitama Prefecture in 1983. After graduating in painting from the Fine Arts Department of Tokyo Zokei University she entered Tokyo University of the Arts’ Graduate School of Fine Arts where she studied for her MFA in Inter-media Art and is now enrolled on a doctoral program in the same department. Since 2012 she has been producing works using the keyhole in the door of her home/studio, drawers and other ‘holes’ she finds in her daily environment to create pinhole photographs. She also collects windows from soon-to-be demolished houses and prints images on them of the original views they would have shown, for which she was awarded the Embassy of France Prize at the Art Award Tokyo Marunouchi 2015, the VOCA Exhibition 2016 Encouragement Prize, etc. She produces a wide variety of works, including those utilizing holes in a coffee dripper or saucepan as pinhole cameras, or mirrors that have been printed with images of the people who actually used them or landscapes. Born in his parent’s hometown in Fukushima Prefecture in 1982, he was brought up in Chiba Prefecture. He has been based in New York since 2002 where he works as a photographer and also collaborates with composers as a video artist. In recent years he has produced photograms, a form of photography that does not require a camera. After the Great East Japan Earthquake he collected soil from famous places and historical sites in Japan and used its radioactive content to create a series of photograms entitled ‘Trace’ that was well received. He has participated in numerous international exhibitions, such as the ‘A Different Kind of Order: The ICP Triennial’ (ICP, New York, 2013), ‘In the Wake’ (Museum of Fine Arts in Boston, 2015), etc. He returned to Japan in 2014 and has lived in Sendai City, Miyagi Prefecture since 2015. This exhibition marks the debut of his latest ‘Glaze’ series, which has been created using the effects of various natural processes. Born in Saitama Prefecture in 1970, she began working in photography from 1989 and graduated from the Tokyo College of Photography in 1994. She was initially influenced by the photographer SUZUKI Kiyoshi, producing black-and-white photographs of everyday scenery. She began to use color from 2010 and in 2011 she published her Just like on the radio series (Osiris) that was highly praised for the unique, indescribable atmosphere it creates. She has participated in numerous international exhibitions, including the ‘Polypolis: Art from Asian Pacific Megacities’ (Kunsthaus Hamburg, 2001), ‘Black Out: Contemporary Japanese Photography,’ (Japan Cultural Institute in Rome, 2002), etc. In 2016 she received acclaim for her photo-book NEROLI (Akaaka Art Publishing Inc.) in which she selected works from the large stock of photographs she had taken up until this time. In this exhibition will debut her latest works. *NEROLI is the essence of the flowers of the bitter orange, only a small quantity of which can be extracted from a large amount of flowers. *All the works belong to the artist. In this exhibition, only the works of Kaneyama Takahiro, Katayama Mari, Suzuki Nozomi, Takeda Simpei can be shot. For more information about photo shooting, please clich here. Talks take place at 14:00 on the 2nd and 4th Friday of each month. Free with same-day museum admission.